THE FOLLOWING ARTICLE IS PUBLISHED IN "RINKO" MAGAZINE(APRIL,2001). MR. TOSHIAKI KANOH HAS A SHOP IN MEGURO, TOKYO. THE SHOP IS VERY CLOSE TO MR.KAMIYA'S HOUSE, WHO BECAME THE GRAND CHAMPION OF ALL JAPAN FISH SHOW HELD IN 1999. AS HIS FATHER FELL ILL, KANOH TOOK HIS FIRST STEP TOWARDS BECOMING INDEPENDENT WHEN HE WAS ONLY A UNIVERSITY STUDENT. "I GREW AND MATURED WITH THE HELP OF MY CUSTOMERS", KANOH SAID. THROUGH HIS SPECIAL RELATIONSHIPS WITH MANY PEOPLE AND HIS SPLENDID FEEL FOR FISH, HE IS CONSTRUCTING HIS OWN VIEW OF THE WORLD. - WHEN DID MR.KANOH START YOUR SHOP? MY FATHER STARTED TO SELL NISHIKIGOI IN 1960 WHEN I WAS 1 YEAR OLD. MY FATHER'S NAME WAS HAJIME KANOH, BORN IN 1928. I HAVE TWO ELDER SISTERS AND SINCE I WAS AN ELEMENTARY PUPIL, I'VE HELPED MY FATHER WITH HIS WORK. - YOU LIKE FISHING, DON'T YOU? MY GRANDFATHER AS WELL AS MY FATHER LOVED FISHING. MY GRANDFATHER WAS CHAIRMAN OF FISHING SOCIETY OF HERABUNA (A KIND OF A CRUCIAN CARP) FOR MANY YEARS. HE WAS THE CHAMPION OF HERABUNA FISHING AND MY FATHER WAS VICE-CHAMPION. THEY WERE RIVALS IN HERABUNA FISHING. AS A MATTER OF FACT, THEY DIDN'T TELL EACH OTHER ABOUT THE SECRET OF THEIR OWN BAIT. - HOW BIG ARE YOUR MANY PONDS? NOW WE HAVE ONE 15 TONS, ONE 8 TONS, TWO 3 TONS, TWO 2 TONS, TWO 1.5 TONS AND FOUR 1 TON. WE ARE GOING TO CONSTRUCT A NEW POND OF 30 TONS. - DO YOU THINK THERE IS A BIG DIFFERENCE BETWEEN THE PEOPLE WHO KEEP FISH NOW AND THOSE DURING THE OLD DAYS? I THINK PEOPLE IN TOKYO NOW CAN KEEP FISH EVEN AT THE VERANDA OF THEIR APARTMENTS OR ON THE ROOF (GARDEN) OF THEIR BUILDINGS. I THINK THE AGE GROUP OF THOSE WHO KEEP FISH IS YOUNGER THAN IN MY FATHER'S ERA. SOME PEOPLE START TO KEEP FISH AT 20'S. SO, THEY HAVE KEPT FISH FOR OVER 20 YEARS THOUGH THEY ARE STILL ALMOST THE SAME AGE AS MYSELF. - IS IT INTERESTING TO ENCOURAGE MORE PEOPLE TO LOVE FISH? IT REALLY IS. SOMETIMES A CUSTOMER ASKS US, "HOW MUCH IS THE CHEAPEST NISHIKIGOI?" I ANSWER, "IT'S 500 YEN." THEN,HE IS SO SURPRISED. MOST PEOPLE BELIEVE NISHIKIGOI IS AN EXPENSIVE FISH. I THINK SUCH A WRONG PRECONCEPTION IS A MINUS FOR US. IF THE CUSTOMER KNOWS THAT HE CAN KEEP FISH EVEN IF HE DOESN'T HAVE A POND OR HE CAN GET FISH AT A REASONABLE PRICE, I THINK THE NUMBER OF ENTHUSIASTS WILL INCREASE. - IS THERE ANYTHING SPECIAL FOR BEGINNERS TO PAY ATTENTION TO? - WHAT DO YOU ADVISE BEGINNERS TO DO? I ADVISE THEM TO USE THEIR MONEY FOR EQUIPMENT BEFORE BUYING NISHIKIGOI. MOREOVER, I ADVISE THEM TO PRACTICE KEEPING FISH OF LOWER PRICE FOR A YEAR AND THEN TO STEP UPWARDS TO KEEPING A LITTLE BETTER GRADE FISH. FOR FURTHER ENCOURAGEMENT, IF THEY PUT ONE SUPERIOR FISH IN THE POND, THEY WILL TAKE CARE OF THEIR FISH MORE CAREFULLY. GRADUALLY THEY WILL IMPROVE AND BE GOOD AT KEEPING FISH. FURTHERMORE, WE DON'T SELL A BABY FISH TO BEGINNERS IN THE FIRST YEAR BECAUSE A BABY FISH HAS LOW RESISTANCE TO DISEASES. - YOU HAVE A WEB-SITE, DON'T YOU? WE STARTED IT OVER 2 YEARS AGO. A LOT OF PEOPLE LOOK AT OUR WEB SITE AND SOMETIMES THEY SEND US E-MAIL ASKING QUESTIONS. 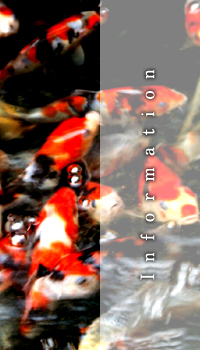 OUR WEB SITE IS COMPOSED OF 3 PARTS, NISHIKIGOI, TROPICAL FISH AND RECOMMENDABLE GOODS. WE SELL MUCH MORE TROPICAL FISH THAN NISHIKIGOI THROUGH INTER-NET BUT THE ACCESS TO OUR WEB SITE OF NISHIKIGOI IS MORE THAN THAT OF TROPICAL FISH. IT MEANS THERE ARE SO MANY PEOPLE WHO ARE INTERESTED IN NISHIKIGOI. - HOW DO YOU SELL FISH THROUGH INTER-NET? WE EXCHANGE E-MAIL HOW TO KEEP FISH OR HOW TO SELECT FISH. WE SEND PHOTOS TO CUSTOMERS AND WE SELL THE FISH THROUGH COMMUNICATION. - WHEN DID YOU START TO SELL TROPICAL FISH? 7 YEARS AGO. BEFORE STARTING TO SELL TROPICAL FISH, I ASKED MY CUSTOMERS HOW THEY STARTED KEEPING FISH. SOME PEOPLE STARTED WITH GOLD FISH, SOME STARTED WITH CHINESE GOLD FISH. THE PEOPLE WHO ARE INTERESTED IN TROPICAL FISH STARTED BY KEEPING SMALL FISH AND THEN CHANGE TO KEEP AROWANA OR DISCUS. I BELIEVE THE PEOPLE WHO KEEP BIG TROPICAL FISH LIKE AROWANA ARE INTERESTED IN NISHIKIGOI. THEY HAVE A POSSIBILITY TO KEEP NISHIKIGOI. - IS THERE ANYTHING TO ADVISE ABOUT KEEPING FISH? THE INTERESTING POINT TO KEEP FISH IS TO GROW FISH BY ONESELF, SO I THINK IT'S BETTER TO TAKE PART IN FISH SHOWS (COMPETITION) IF THE FISH GROW AS WELL AS WE EXPECTED. - WHICH BREEDER DO YOU BUY FISH FROM? SAKAI, OGAWA, SENOO AND SHIMOMURA, MAINLY. SENOO IS THE SAME AGE AS ME AND WHEN HE WAS A UNIVERSITY STUDENT, HE HELPED US AS A PART-TIME WORKER. MY FATHER TOLD ME, "SENOO WORKED HARDER THAN YOU." AFTER GRADUATION, SENOO WORKED AT OGAWA FISH-FARM UNTIL HE BECAME INDEPENDENT WITH HIS OWN FARM. IN 1984, I WAS INVITED TO INDONESIA TO A FISH SHOW WITH MR.YUGAMI WHO TAUGHT NISHIKIGOI TO ME. WE BROUGHT BACK A LONG FIN KOI FROM INDONESIA. MR.YUGAMI USED ONE OF THEM FOR BREEDING KOHAKU BUT GOT NOT KOHAKU BUT YELLOW + WHITE FISH. THE BLOOD LINE OF THE INDONESIAN LONG FIN KOI WAS PASSED ON TO A GINRIN KOHAKU OF SHINODA FARM, NIIGATA, THAT GOT THE BIGGEST PRIZE IN ONE OF THE BIGGEST FISH SHOW BY BREEDERS IN NIIGATA. WHEN I WAS A UNIVERSITY STUDENT, MR.YUGAMI ADVISED ME TO BUY NISHIKIGOI BY MYSELF AND TO GROW THEM BIGGER IN THE MUD POND. I FOLLOWED HIS ADVICE AND I BEGAN TO KNOW HOW INTERESTING IT WAS TO KEEP FISH. AS MY FATHER COULDN'T WORK SO MUCH DUE TO HIS ILLNESS, I WORKED AT MY SHOP FOR 6 DAYS A WEEK AND WENT TO SCHOOL JUST FOR ONE DAY. MY FATHER FELL DOWN AGAIN AND DIED 7 YEARS AGO. I THINK I HAD SOME PREPARATION PERIOD TO BECOME INDEPENDENT BEFORE MY FATHER'S DEATH. - DID YOU HAVE ANY HESITATION TO SUCCEED TO YOUR FATHER'S JOB? SINCE I WAS A LITTLE BOY, I WANTED TO GET A JOB CONNECTED WITH ANIMALS AS WELL AS FISH. I SUCCEEDED TO THIS JOB AFTER GRADUATION FROM THE UNIVERSITY, BUT EVEN SO, I WAS PUZZLED IF IT IS REALLY THE PROPER JOB FOR ME. I BELIEVE I WAS DESTINED TO BECOME A NISHIKIGOI DEALER BECAUSE OF THE WONDERFUL CUSTOMERS I HAVE MET. - DO YOU EXPORT FISH TO OVERSEAS? I EXPORT FISH MAINLY TO SOUTH-EAST ASIA NOT TO DEALERS BUT TO ORDINARY CUSTOMERS. I WENT TO THAILAND THIS FEBRUARY TO MEET MY BEST FRIEND WHO LOVES NISHIKIGOI SO MUCH. WE HAVE BEEN IN CONTACT FOR 20 YEARS. HE HAD A GOOD RELATIONSHIP WITH MY FATHER, TOO. THIS TIME, I WENT TO SEE HIS NEW POOL. HE CONSTRUCTED A PAVILION "KYORIAN" NAMED BY MY FATHER 16 YEARS AGO. WHEN I SAW IT, I THOUGHT MY FATHER IS LIVING HERE! NEAR THE PAVILION, THERE ARE A 30 TONS POND AND A 100 TONS POND. - THE PEOPLE OVERSEAS NOWADAYS ARE GOOD AT GROWING HIGH QUALITY FISH, AREN'T THEY? MY CUSTOMER IN THAILAND COLLECTS TOP QUALITY FISH IN COMPARISON WITH JAPANESE CUSTOMERS AND HE HAS GOOD EYES TO JUDGE FISH. I THINK THERE IS NO DIFFERENCE BETWEEN JAPANESE CUSTOMERS AND OVERSEAS CUSTOMERS. ADDITIONALLY, ON ACCOUNT OF THE SPREAD OF THE INTER-NET BUSINESS, EVERYONE IN THE WORLD CAN SEE OUR FISH WITHOUT ANY TIME DIFFERENCE. IT'S A TIME TO JUDGE OUR TRUE WORTH. SOME FOREIGNERS STAYING AT HOTELS IN TOKYO VISIT OUR SHOP THROUGH INTRODUCTIONS BY THE HOTELS. - DO YOU HAVE ANY PLAN TO ENCOURAGE CUSTOMERS? WE HAVE A SOCIETY CALLED "KYORIKAI" COMPOSED OF ABOUT 20 MEMBERS. WE STUDY A CERTAIN BLOOD LINE, ETC. SOMETIMES WE COMPARE SOME PHOTOS OF THE CHANGE OF A FISH DURING ITS GROWTH. SOME PEOPLE ARE VERY INTERESTED IN THE SNOW WHITE SKIN OF A CERTAIN FISH, AND SOME ARE INTERSTED IN A POWERFUL AND IMPRESSIVE SUMI OF ANOTHER FISH. I THINK IT IS A TIME TO FOCUS ON THE SPECIFIC APPEARANCE OR CHARACTERISTIC OF A FISH. WE HELD OUR 50TH MEETING THIS JANUARY. WE HOLD IT ONCE A YEAR NOW ALTHOUGH WE HELD IT TWICE A YEAR BEFORE. WHEN WE HELD A MEETING THIS JANUARY, WE PREPARED 100 BABY FISH (MAINLY SHOWA, SANKE AND KOHAKU). PARTICIPANTS CAN CHOOSE 1 FISH OUT OF 100 FISH WITHIN 2 MINUTES ALTERNATELY ONE BY ONE. THEY WILL BRING THE FISH THEY CHOSE TO OUR SHOP IN THE NEXT YEAR TO COMPARE THE CHANGE WITHIN A YEAR. THE PARTICIPANTS SAID,"TO CHOOSE 1 FISH OUT OF 100 FISH WITHIN A SHORT TIME IS HELPFUL TO TRAIN OUR EYES". WE ENJOY OUR JOB WITH OUR CUSTOMERS! 2005 Copyright (c) Kanoh syoji inc. All rights Reserved.